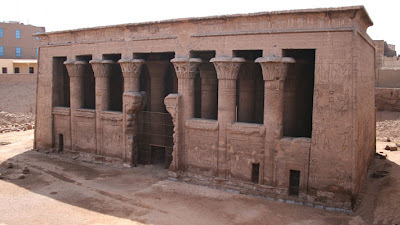 The temple of Esna is primarily dedicated to Khnum (a god of the Nile who moulded the "ka" on his potters wheel) but was also dedicated to a number of other deities, most notably Neith (the ancient goddess of war and weaving) and Heka ( the personification of magic) Satet (a goddess of the Nile) and Menhet (the lion goddess who was the wife of Khnum at Esna). The temple was built almost nine metres below ground level and although the hypostyle hall was excavated by Marriett, the rest of the temple is still buried underneath the modern town. As a result the temple appears to sit in a large pit hollowed out from the town. 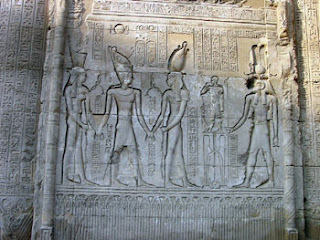 Although some masonry blocks attesting to the construction during the reign of Thuthmosis III have been reused at the site, the oldest complete part of the temple is the back wall of the hypostyle hall which was built during the Ptolemaic period and features depictions of Ptolemy VI Philometer and Ptolemy VIII Euergetes. 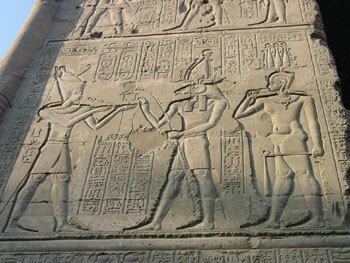 The rest of the excavated building was built by a series of Roman Emperors from Claudius (41-54 AD) Decius to Decius (249-251 AD)..
On the northern wall of the hall the pharaoh is depicted catching wild birds - symbolically representing him subduing evil spirits. At the east corner there is a strange hymn to Khnum in which the name of the god is written using the hieroglyph of a crocodile. At the opposite corner the hymn is repeated but with the name of the god written with the more traditional ram head. The decorations also include a number of calendars and the ceiling is decorated with Egyptian astronomical figures on the northern side and Roman zodiacal signs on the southern side.